The most important asset in a business is its customers, and a well-maintained parking lot for your business can provide a big boost to customer satisfaction and convenience. On the other hand, a commercial parking lot can also be a liability. If it’s not well designed or not looked after, it can be a nuisance—or, worse, a dangerous hazard—to your customers. As a versatile and durable substance that provides excellent value for the money, concrete should be your first choice when it comes to a business parking lot. It requires proper planning and maintenance to continue being safe, so here are a few essential tips to make sure yours will always do right by your customers. Anything that happens on your property, which includes your parking lot, is the responsibility of your business. That means if there’s an accident on your lot, you’re liable. 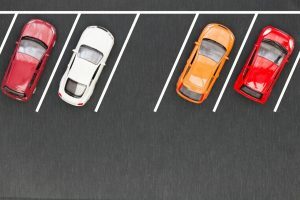 Not only could a badly constructed parking lot cause a nasty injury to someone or damage to their vehicle, but it might also cost you thousands of dollars in costly lawsuits and claims for damages. 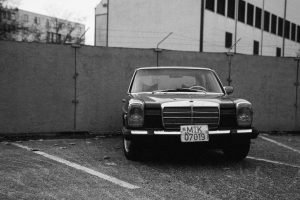 Determining who is at fault is always tricky in these situations, but you will have a much better chance of avoiding a lawsuit and having a much better relationship with your customers when you have a safe parking lot. 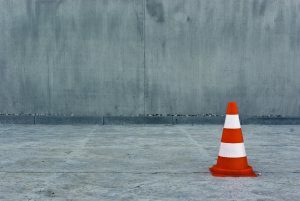 Building a concrete parking lot might seem like it’s the simplest thing in the world, but a lot of thought has to go into the design and construction before you even get started. So many accidents can be avoided just by getting the parking lot right in the first place. Here are some factors you’ll have to consider before you build. Done properly, a concrete patio, driveway, or commercial parking lot can last upward of 25 years. However, as a transport hub for your business, your parking lot is going to see a lot more traffic—and a lot more punishment—than a residential concrete slab. With so much pressure applied to it, day in and day out, laying the concrete down on a stable and solid foundation is vital. Any existing structure will need to be removed or made uniform, or the soil foundation will have to be prepared adequately. Cracks, potholes, and unevenness will appear quicker than you think if this isn’t done properly. Both cars and pedestrians can be harmed by improper drainage on your site. Pooling of water doesn’t just cause your customers to get wet shoes—it’s much easier to slip and fall, or for a car to skid, on a wet surface. Concrete gutters, correctly installed (and placed) drains, and even a gentle slope if necessary all go a long way toward ensuring that any rain or liquid can naturally run off your lot. Over time, some water pooling will be inevitable, but it’s your job to make sure that the water doesn’t stay around for long. While heavy weather most often causes problems with drainage, it can present other hazardous situations, too. Depending on where your business is based, you may also have to deal with dust, hail, snow, strong winds, and ice. The location and climate will have to be taken into consideration when your parking lot is designed, so you avoid environmental wear and tear (like cracks and holes) and dangerous surfaces. It’s always best to choose a concrete contractor that knows your area well. Some of the most common incidents that happen in a business parking lot are low-speed collisions between cars as they are parking. While it is to some degree up to the driver to be aware of their surroundings, it’s also your responsibility to present customers with a parking lot that’s easy to navigate and not filled with blind spots. Space is almost always at a premium, but you’ll have to make sure that you’re not trying to squeeze too many parking spots into your lot. Customers shouldn’t have to fight their way into and out of a spot. At the same time, the layout of the parking lot has to ensure a smooth flow of traffic at all times—frustrated drivers and those who can’t see where they’re going are more likely to get into an accident. Other things to consider, although not specific to concrete parking lots, are the other security and safety features you’re going to install. Proper lighting deters crime and theft, and adequate signage will make the parking process smoother. You may want to install security fencing to protect the vehicles and prevent overnight usage of the space, as well as CCTV cameras. A final thing to consider is to have regular and consistent monitoring of the carpark by a private security firm. Thankfully, concrete installed by a reputable and professional concrete contracting company won’t need too much maintenance. Concrete is a tough surface, and it can withstand a lot of stress before it starts to show signs of wear. If you are dealing with an old parking lot where cracks have started to appear, you’ll have to assess how much damage has been done. You’ll then be faced with a question: Should you resurface the concrete to seal the cracks and holes, or will you need to remove it entirely and start again? Either way, you’ll need to address the situation before an accident happens. Both methods have their pros and cons, and it’s probably a sound idea to have your local concrete contractor recommend the next steps and provide a quote. Time is never on the side of a business owner. Sometimes you won’t notice problems with your parking lot before it’s too late. However, if you have multiple employees, you can turn to them for help. By empowering your employees to monitor the condition of the parking lot and alert you of any potential hazards, they will develop a healthy approach to problem-solving as well as increase their emotional investment in the business. At the same time, you get a safe, beautiful parking lot that will greatly increase customer satisfaction. It’s a win-win. Cross Construction Services (CCS Concrete Driveways) is the Houston concrete contractor to call when you need a long-lasting commercial parking lot that will drive your business forward. With 30 years of experience, you’re guaranteed a commercial driveway that will not only suit you and your company (and fit your budget!) but keep your customers safe for years to come. We’re honest, reputable, and passionate locals who can provide expert advice and professional, on-time services for all your concrete needs, whether that’s redesigning concrete patios or building a brand-new parking lot. Call us at (713) 254-1703 for a free quote and find out how you can expand your business today!